The best way to spend less on food is to throw less food away. Shop carefully to avoid overbuying, and preserve excess food items to reduce food waste going to the landfill. Cut down on fast food with its wrappers, bags, boxes, disposable cups, and plastic straws. You'll keep waste out of the landfill and save money, too. Use a rain barrel to provide water for your plants with no chlorine or other added chemicals. This saves the energy of pumping water out of the ground, and you'll save on your water bill. Get the most fuel-efficient car that meets your daily needs. If you occasionally need more capacity, you can borrow or even rent a vehicle and still come out ahead. You'll spend less on gas every day and add less pollution to the air. Keeping your tires fully inflated is the easiest thing you can do to improve your fuel economy. Air up your tires for a couple quarters at the gas station to save money — and gas — every time you drive. Everyone knows you can save money and burn less gas by walking or riding a bike instead of driving. If this is not feasible, try to combine trips to reduce how much driving you need to do. You may be able to have someone else drive you to work, freeing up some time to read and relax on the ride while saving gas, too. If you do not have convenient mass transit in your area, see if your employer has organized a carpool, or start your own. Use email rather than snail mail for letters, paying bills, and sending greeting cards to reduce the carbon footprint from trucking mail around. Plus, you can also save money on postage. It takes a lot of resources and energy to produce a technology device. Before you get rid of your current device and pay extra get the new model, consider whether the upgrade is really worthwhile. If you find yourself throwing away a lot of batteries, pick up some rechargeable batteries you'll save money and reduce waste from spent batteries going to the landfill. Work to reduce the amount of printouts and paper copies of documents you make. Save paper, ink, toner, space, and money but cutting back on printing. In summer, turn off the A/C and open the windows (and maybe turn on a fan). In the winter, turn down the heat and put on a sweater. You'll end up saving fossil fuel and money. Regularly replace your furnace filter with a clean one so your heating and cooling system runs at higher efficiency, saving money and energy. Turn off unused lights and unplug appliances when you're done using them to reduce your electric bill and your demand for electric energy production. Use free solar power in your yard to dry clothes on a clothesline. 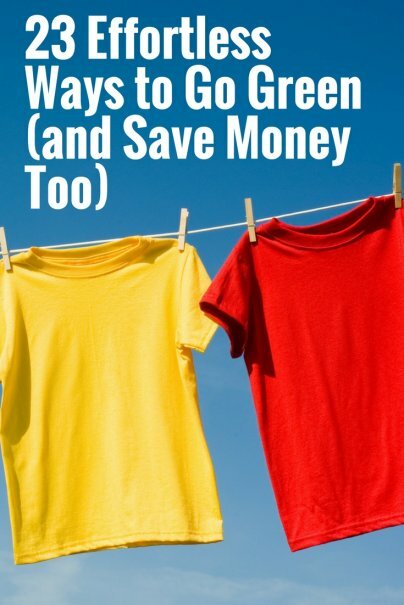 Save money, electricity, and wear-and-tear on your clothes dryer. An easy green upgrade is to replace your incandescent light bulbs with LED light bulbs. This will save you money on your electric bill and reduce your energy consumption to light your home. After realizing how many plastic spoons and forks I was throwing away at lunch, I took a set of silverware from home to work and use it every day. Try to identify disposable products you are using and replace them with reusable products instead. The initial cost of higher quality products may be higher, but the overall cost of ownership is lower over the life of the product. Longer-lasting products are greener than products that need to be replaced after a short life, as it requires less resources to meet a lower product demand. Choose products that minimize packaging, and therefore waste. For example, use refillable dispensers for items such as hand soap and laundry soap that you can replenish from an efficient bulk container. The bulk supply is often cheaper than buying a new dispenser each time, too. Paper or plastic? How about neither! Some stores offer a discount if you bring your own shopping bag. For example, a local store near me offers 10 cents per bag discount, or you can donate it to charity. Plus, I find that my reusable bags are sturdier and better protect my items than disposable plastic bags.